Guest blog post by John Bryson, Secretary of Commerce. Cross-posted at Chamber Post. Today, the President announced his plan to ask Congress for the authority to reorganize and consolidate the government so we can provide more effective, efficient services to the American people. He wants this authority, which Presidents had until it lapsed in 1984, so that we can modernize our structure to better compete in the global economy and maximize services for the American people. And the first priority would be to strengthen the ways that American businesses – large and small – can work with the government to compete, export, and grow. There is not a federal agency that can't be better or smarter in accomplishing its mission. That's why this consolidation authority is so critical. Many of the structures in place right now are outmoded and outdated. More specifically, today the President also announced that he would use such authority to organize all of the business and trade related functions into a new department, including many functions of the Commerce Department. Currently, there are six major departments and agencies that focus primarily on business and trade in the federal government, including: U.S. Department of Commerce’s core business and trade functions, the Small Business Administration, the Office of the U.S. Trade Representative, the Export-Import Bank, the Overseas Private Investment Corporation, and the Trade and Development Agency. Consolidating these agencies will create one new Department with one mission: to spur job creation and expand the U.S. economy. As a former CEO, I fully support this approach and know the considerable merits to having all of the economic functions in one department. As I said while speaking before the US Chamber of Commerce last month, as Secretary of Commerce I will prioritize one simple imperative – to help American businesses build it here and sell it everywhere so that we can create more good paying jobs here at home. It is my firm belief that the President’s proposal will enable the entire federal government, to better support businesses to do just that. Submitted on January 14, 2012 - 9:43am. The Administration deserves credit for thinking "outside the box", but the plan has not yet been adequately described. 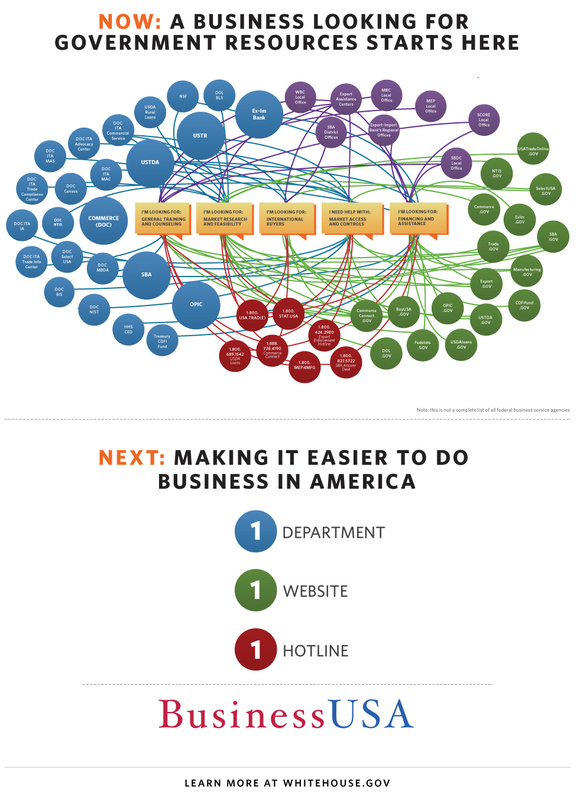 The schematic chart posted here showing the agencies and departments involved in trade and business is small and hard to read. The plan has been vaguely described, at best. It has not been made clear what functions are to be merged or consolidated. Will the new umbrella entity be a cabinet-level department, or a sub-cabinet agency? If it's a cabinet level department, then why not still call it the Commerce Department? How does this plan eliminate a cabinet-level department, then, and is that even advisable? Also, the savings of $3 billion over 10 years seems to be more symbolic than anything. Studies have shown that the U.S. was spending $12 billion per MONTH in Iraq at the height of that war! That was not spread over 10 years, that was per MONTH in real time! Submitted on January 15, 2012 - 9:33pm. What are we going to export? To where will we be exporting? What are the niches in other countries that we have to fill? Can they send me off on a business mission to find the niches in other countries? Submitted on January 16, 2012 - 4:03pm. I thought CommerceConnect was already designed to improve Commerce services for business. Since new, shouldn't it be given a chance? Submitted on January 19, 2012 - 2:16am. The government needs to permanently eliminate the Federal Income Tax, Social Security, Medicare and Unemployment Insurance. After those things happen, businesses and consumers will have more money than they know what to do with, which will automatically increase job access and overall revenue. Why is nobody saying this in Congress? These line items cripple US industry to the point where they are crawling on hands and knees and cannot afford to hire. There is no mystery to the system it is a very simple equation. Submitted on January 20, 2012 - 5:43pm. I'm encouraged by the President's and Secretary's global, forward thinking. (The travel and tourism initiative is a smart start.) No updates since 1984? The "web" was just a spider's nest back then. It's a HUGE task to undertake, in no way easy or simple, but we're overdue to try. I'm disappointed by the limited, ineffectual, self-agenda promoting thinking of other commenters. Submitted on January 20, 2012 - 9:38pm. What are they planning for the U.S. Patent and Trademark Office. I haven't ready anything about that other large Commerce operating unit.